Jobs are necessary for 90% of us. Even some billionaires like to do it for some reason, though technically they don’t have to. Believe it or not, I’ve heard through rumor and speculation that there are actually a small group of rebels out there that actually like to work and when they are asked to go home or on a vacation they get upset. I call this small group of people “weirdos”. Well, back in the 90’s, Dilbert was just a new comic strip that was floundering until one day I decided purchase a book of his. Dilbert, Dogbert and Scott Adams became heroes to me, because they infiltrated the workplace and exposed the dirty secrets of the workplace that really only I knew about at the time. Once people got wind of my purchase of the book, the Dilbert franchise became a best selling franchise and Scott Adams was encouraged to write many more books and collect many more dollars and cents. 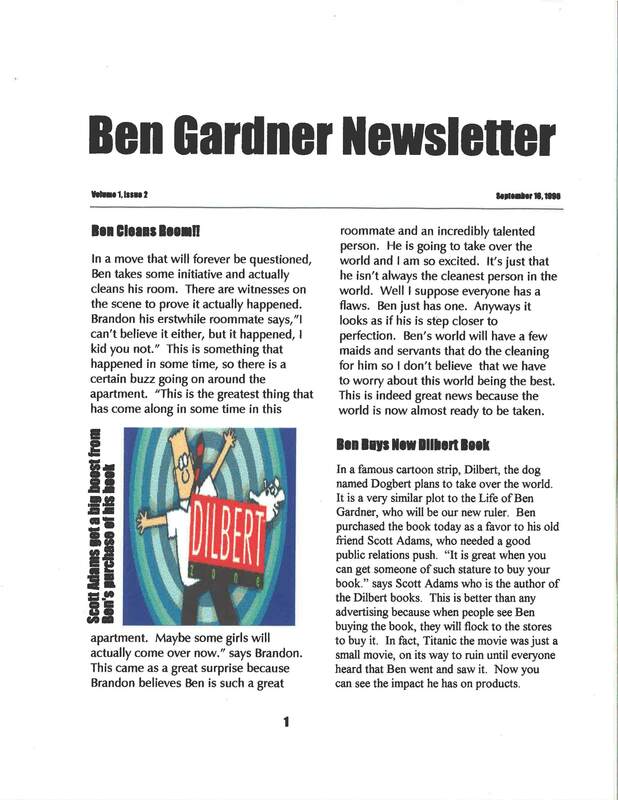 For this reason I chose to feature them in the 2nd Volume of the Ben Gardner Newsletter, seen below. I should have taken pictures of the clean room back then, because it was the last time it was ever clean. Stay tuned for the next horribly written and even worse graphiced Ben Gardner Newsletter Vol. 3. Hint: Tim the Toolman, and Uncle Ben. You know, come to think of it, I was on that mailing list Scott Adams started in the mid-90s promising to set up the new ruling class when the revolution came. I think I might’ve been in early enough to be assured extra servants. I should probably drop a letter and see how that revolution is coming along; I’ve got stuff to finish that someone else could do easily. Well, since you didn’t make it as part of the ruling class, perhaps you could join the bitter class and always be disappointed by me. what a hero you are! no wonder you don’t have time to clean your room. I also don’t have any time to do work at my job, but they keep telling me I have to. Just tell them you can’t accommodate them until you make your bed and clean up your room (it always worked for me… ‘course I was eleven, but you never know). I need to tell them I can’t work because I’m bitter blogging and taking over the world. I like to skip the middle man. Tim the tool man just can’t wait. OH OH Oh! So great! Love your sense of humor. Ha. But the grammar. I wish I could go back and teach that young dude how to write stuff. Will you like my book (if it ever gets published) so I can become rich and famous too? If you get published I promise I will read your book. I may or may not still have the same pinache as I used to have. If gold is rust colored then yes, you are correct. Yeah, Dilbert and the gang are weirdo’s, but they couldn’t be any worse than the weirdo’s I work with. That’s cool that you and Scott Adams are so tight. He likes studying how bad I am at my job to get inspiration on how rough life is for Dilbert. So that’s why Titanic became such a hit! And here I was, thinking it was that scene where the guy jumps off the ship and hits the propeller. That scene was part of it. But only because I liked that scene.